1. The competition is open to original, unpublished and unbroadcast short stories in the English language of 3,000 words or fewer. The story can be on any subject, in any style, by a writer of any nationality, living anywhere in the world. Minimum age for entry is 16 years old. Unfortunately, translated work is not in the scope of this competition. 2. Judging for this competition is ANONYMOUS. The entrant's name and contact details (address, phone number) must be on a separate piece of paper or in a separate Word document attached to your email. Manuscripts cannot be returned. Entries should be typed. 3. Each entry must be accompanied by an entry fee of €15 or £15. Entrants other than those from Ireland or the UK must pay by Paypal, where their currency will be converted to Euro. You may submit as many entries as you wish. For non paypal payments only cheques or drafts drawn on an Irish or British bank can be accepted and must be made payable to THE MUNSTER LITERATURE CENTRE. Paypal link available below for payments in Euro. 4. Closing date is 31st July 2016. All non-email entries must be postmarked before or on that date (i.e. entries posted before or on the date will be accepted after 31st July provided they are sent via airmail). 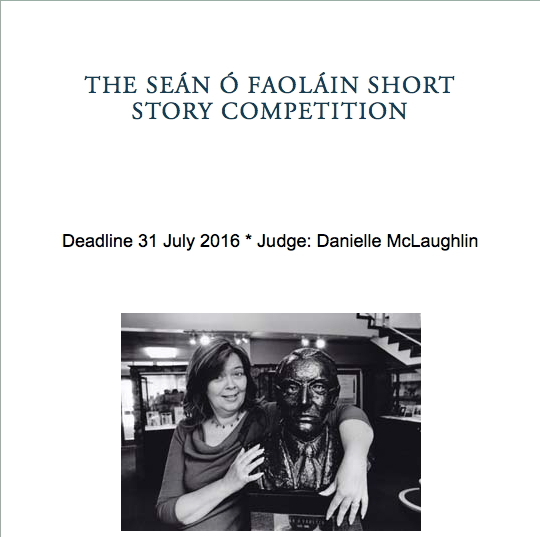 Entries must be sent to The Seán Ó Faoláin Short Story Competition, The Munster Literature Centre, Frank O'Connor House, 84 Douglas Street, Cork, Ireland (no postal/zipcode). 5. The winners will be announced at the Cork International Short Story Festival in Cork, 7 - 11 September 2016. The winner of the first prize will be invited to read their prize-winning story at the festival. If the winner comes to Cork to collect their prize, we will lavish them with hotel accommodation, meals, drinks and VIP access to the literary stars. 6. If you require acknowledgement of your entry, you must submit a self-addressed stamped postcard. SASEs for international entries should include money for IRISH stamps. Please do not include SASEs with foreign stamps. 7. The Judge's decision is final. Due to the volume of entries we receive each year, the judge will not be able to reply individually to unsuccessful submissions. However, we will notify all entrants of the shortlist via our e-mail newsletter (click here to to subscribe). A shortlist will be posted on our website in September and the winner will be announced at the festival. Winners and shortlistees will be notified individually. 8. It would greatly assist us if you let us know how you heard of the competition (whether through mailshot, word of mouth, advertisements, newspaper, website, etc.) with your entry. 1. Send your entry as a Microsoft Word document (files ending with ".doc"). Please ensure that you do NOT send PDF files. 2. Include the story and a letter including contact details / payment information as separate documents in the same email. 3. Pay your entry fee through Paypal (see link below). Paypal accepts Mastercard and Visa and guarantees secure transactions. All Paypal payments are in Euro.